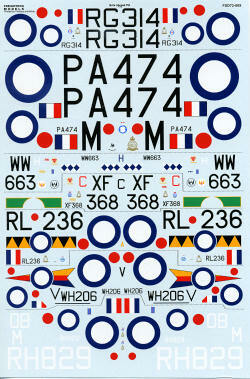 This new sheet from FreightDog Models covers 7 different post war RAF aircraft in several different schemes. The sheet itself is printed by Fantasy Printshop so you know it is of high quality. It seems as if they have done the instruction booklet as well. Each page has complete information on a single scheme and that includes the camouflage colors and the various paint companies that provide each shade. This also has the markings placement guide and a listing of available kits that can be used with each option. Frankly, this is the way all decal sheets should be if there are multiple variations. 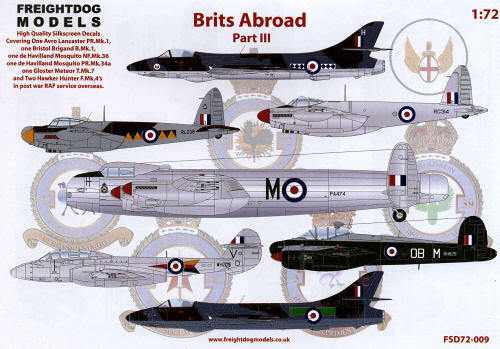 From the booklet, the first option is a Brigand B.1 from 45 Squadron in Malaya during 1950. This one is in the Medium Sea Grey upper with Night undersides. In High Speed Silver is a Meteor T.7 from 8 Squadron at Aden in 1958. The Mosquito PR.34A is also in High Speed Silver and from 81 Squadron at RAF Seletar in 1955. This plane flew the last operational Mosquito sortie in the RAF. The other Hunter F.4 is from 14 Squadron in Germany during 1957. This one has a Silver underside. The heavy in the group is a Lancaster PR.1 from 82 Squadron flying from Kenya in 1952. Overall High Speed Silver. Finally, in a camo scheme of Medium Sea Grey and Dark Green is Mosquito NF.36 of 39 Squadron based in Egypt during 1953. In all, a superb sheet with many interesting schemes. Available kits and conversion sets are listed for each kit that need it. Thanks to www.freightdogmodels.co.uk for the review sheet. You can get yours direct from the link.